I am liking the kettlebell more and more. When I was in Las Vegas last month, the gym at the Vdara had a rack of kettlebells. This was the first time that I have ever seen them in a hotel gym. It was cool to play with them. I am starting to use them for injury recovery, mobility and for a workout. Now Forest is an experienced kettlebell guy and he is going to share with you how you can use kettlebells for corrective exercise, enjoy. At first glance, a kettlebell (KB) looks like a cast-iron wrecking ball. The fundamental HardStyle kettlebell exercise is the swing. But, quite to the contrary, KB’s are a great tool for corrective exercise training. They can be used to treat individuals with pain in the low back, shoulder, knee, ankle, and much more. In this article, I’m going to talk about a few specific reasons why kettlebells are a great tool for corrective exercise – and then give you a sample KB workout to get you started! The odd shape of the kettlebell – essentially a fat-grip handle with a ball-shaped weight attached to it – makes it (among other things) unwieldy. But – objects in the real world are odd-shaped as well – so this is a GOOD thing if we’re trying to teach proper lifting mechanics – which is key in proper movement. Pain many times is not present when a subject lays still – but presents itself in various ways during dynamic movement. For example, shoulder pain may not be present when the subject is in a seated position, but when attempting to get up off the floor, the pain may be aggravated. 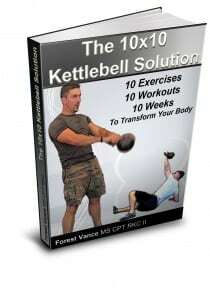 Training with kettlebells is a great way to integrate dynamic movement into the pain relief progression. Going back to the kettlebell swing example, this is a movement that requires dynamic – and actually ballistic – motion under a load, which happens frequently in real life. Proper execution of all foundational kettlebell movements demand muscle activation (especially scapular stabilization) of those muscle groups that protect the spine, lower back and pelvis – and this is key for taking a preventive approach to pain management. Perform these two exercises back-to-back without rest for about :30 each non-stop; repeat the pair of warm-up movements twice without rest. Continue this sequence non-stop for 10 Minutes. In conclusion, although your first impression may be otherwise, kettlebells are actually a great tool for corrective exercise. The workout provided in this article is a great starting point for your training in corrective kettlebell exercise! Thanks for reading, and train hard.